On Wednesday, April 1 the Winter Hill Community Innovation School was treated to a lunchtime visit by Somerville Mayor Joseph Curtatone and Superintendent of Schools Tony Pierantozzi. The Mayor and Superintendent were at the Winter Hill attending one of our National Nutrition Month Celebrations, which included joining students during lunch period and taking part in a taste test. In a speech to the students, both the Mayor and the Superintendent reminded students about the importance of eating fresh foods and whole grains. They emphasized that food is the fuel that gives our bodies energy to be physically active and stay fit. The Mayor challenged the students to be ambassadors for health in their own lives, encouraging friends and family members to "Bite into a Healthy Lifestyle." Superintendent Tony Pierantozzi addressing Winter Hill students. Mayor Joseph Curtatone reminding students to be ambassadors for health. The Mayor and Superintendent also personally thanked the kitchen staff for their dedication to producing high quality, nutritious foods for Somerville students. This dedication and hard work were also recognized by the USDA. Six Somerville elementary schools received the USDA's HealthierUS School Challenge Bronze Award for excellence in nutrition and physical activity. While the quality, stability and dependability of the school lunch and physical education programs were honored, we also shared details about innovative nutrition education and physical activity programs being piloted and implemented in the district through funding from a Carol M. White Physical Education Program Grant (PEP Grant). According to Caitlin Kelly, PEP Grant Director, "The PEP grant is working to 'Create a Culture of Healthy Lifestyles' by expanding opportunities for physical activity and nutrition education and healthy eating among our students." Somerville Neighborhood News was on hand to film the event. Throughout the celebration students tasted freshly made veggie yogurt dip. 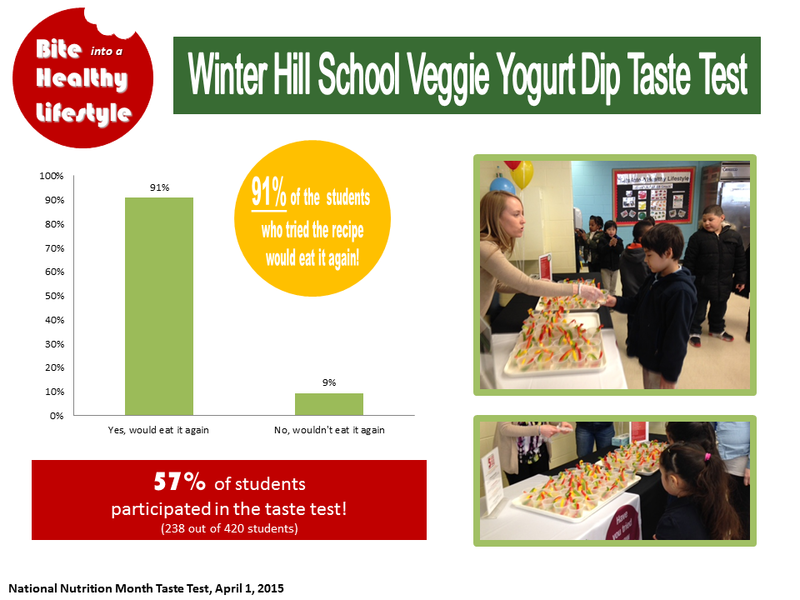 Over 90% of the students who tried the veggie dip would eat it again! We extend a special thank you to all of our collaborators, especially UMass Team Nutrition and Shape Up Somerville, for all of their hard work. Content provided by Karyn Novakowski, PEP Grant Nutrition Education Coordinator.